Videozilla is video converter to convert video files AVI, WMV, MPEG, RM, MOV, ASF, SWF, FLV, F4V, MPEG-4 (iPhone/iPad/MP4/iPod/Mobile/PSP/Tablet), M4V, MKV, VOB, 3GP, 3G2, DAT, WEBM, OGM, OGV, Blu-ray, HD Video (AVCHD, MTS, M2T, M2TS, TS) that works via right-click menu on the selected video files. 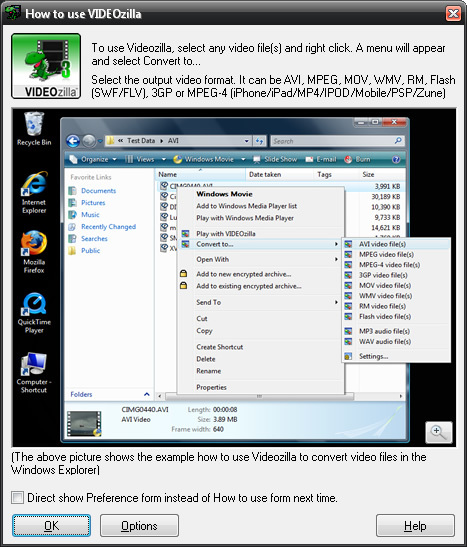 With only a click needed, Videozilla offers the easiest and fastest solution to convert video files to other format. Options can be set for start and end points of video conversion; video width and height; video and audio quality; plenty of codecs choices are available. 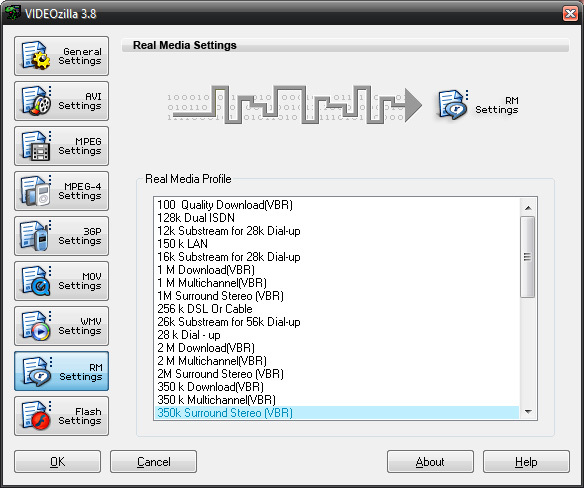 Videozilla also perform audio extraction from video and save as audio MP3 or WAV. 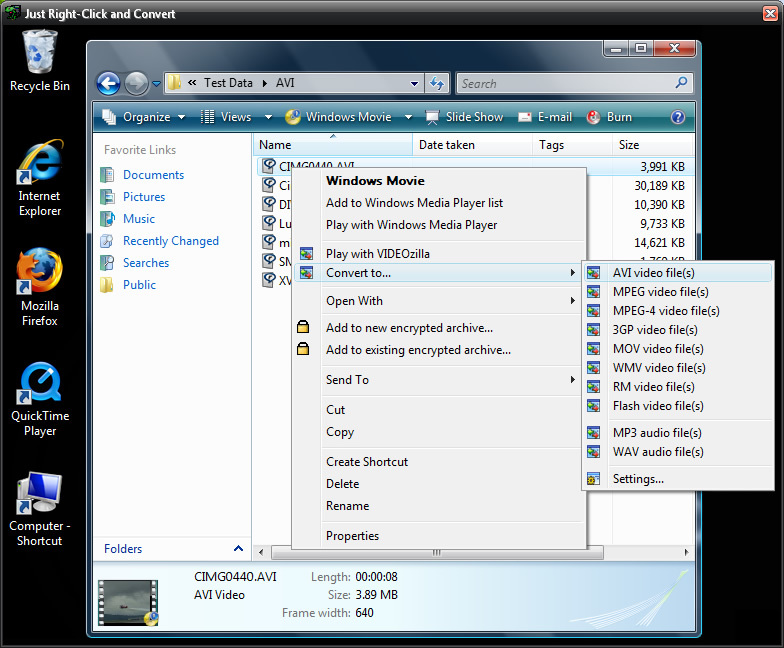 Just right-click any video files on Windows Explorer and click convert on the context menu shown, Videozilla will immediately convert the video files to other video formats or extract the video as audio. Command-Line based video conversion is also supported. Convert video between almost any formats: AVI (DivX, XviD, MS MPEG-4, Uncompressed, Cinepak and other), MPEG (MPEG-1 and MPEG-2 Video, VCD and SVCD, PAL, and NTSC), MPEG-4 format (iPhone, iPad, MP4, IPOD, Mobile, PSP, Zune, MOV 7, M4V), H.263, H.264, 3GP, 3G2, WMV, ASF, QuickTime (MOV, QT), FLV, F4V, SWF, Real Video (RM, RMVB), DAT, Matroska (MKV), WEBM, HD-Video (AVCHD, Blu-ray, MPEG-2 HD, MTS, M2T, M2TS, TS), DVD (VOB), OGG Media (OGM, OGV). Convert FLV video (eg. 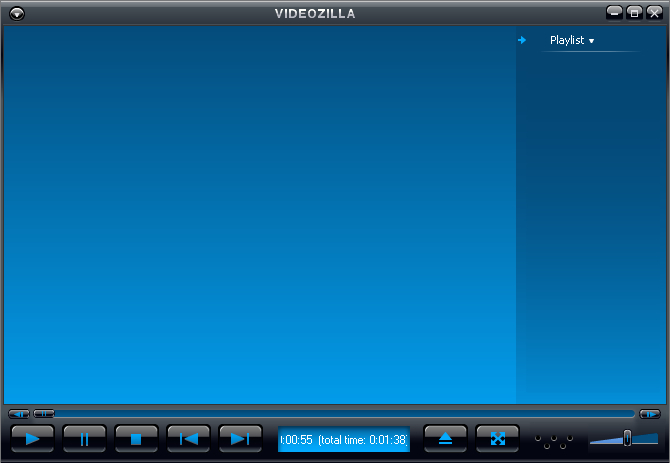 You tube video) files to video/audio format supported by Videozilla. Convert video files for your iPhone, iPad, IPOD, Mobile, PSP, Tablet or any other MP4 devices. 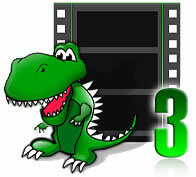 Convert video files to Flash 8 (SWF, FLV), Flash MX (SWF, FLV), Flash 3-6, or Flash Vector SWF. Convert between popular video formats via command-line. Easiest way to convert video file(s). Just right-click and convert. Support playback of all popular video formats. FLV video playback is also supported.